Duberstein is pulling for Obama. 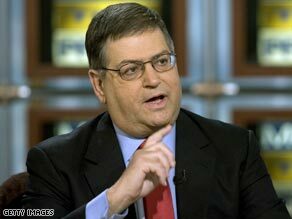 (CNN) - Former Reagan chief of staff Ken Duberstein told CNN's Fareed Zakaria this week he intends to vote for Democrat Barack Obama on Tuesday. "Well let's put it this way – I think Colin Powell's decision is in fact the good housekeeping seal of approval on Barack Obama." Powell served as national security advisor to Reagan during Duberstein's tenure as chief of staff. Duberstein spoke with Zakaria about his final days in the Reagan White House. The Reagan official, along with Clinton Secretary of State Madeleine Albright and Carter National Security Advisor Zbigniew Brzezinski, also discussed the transition process to a new administration. Watch the full discussion on the next administration this Sunday at 1 p.m. on Fareed Zakaria GPS.